Audi launched three new engines at the 2006 Paris Motor Show – one being a new 2.8 litre V6 FSI engine with Audi’s new valvelift system, a new 1.8 litre Turbo FSI engine and a new more powerful variant of the venerable 2.0 litre Turbo FSI engine that will find it’s way into the new Audi S3 hot hatch. The new 2.8 litre V6 FSI engine which will debut in the Audi A6 makes 210hp at 5,500rpm as well as a constant peak torque wave of 280Nm between 3,000rpm and 5,000rpm. The new engine is a shorter stroke version of it’s 3.2 litre big brother, 82.4mm instead of 92.8mm, and retains the same bore of 84.5mm, making it a slightly oversquare configuration. The engine uses an alloy crankcase which gives it a weight of only 165kg. Precise 100 bar pressure FSI direct injection allows a high compression ratio of 12.0:1. New to the engine is Audi’s valvelift system which gives the engine two valve lift profiles on the intake cam. The higher cam profile opens valve through 11mm, while the other cam opens the intake valves at two different lifts – one at 5.7mm and the other at 2mm. This is deliberately done for a swirl and tumble flow effect for intake air. The transition between the two cam profiles is smoothened out via a combination of tricks like temporary retardation of ignition, adjustment of camshafts and closing of throttle valves. A slightly different style of how an engine is built is shown in the form of the new 1.8 Turbo FSI engine. The new 1.8 TFSI engine has higher pressure six-hole injectors – up to 150 bar. 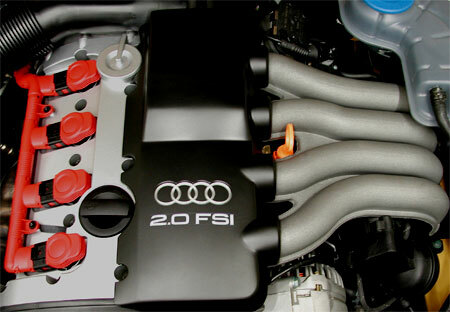 A watercooled Borg Warner K03 turbocharger gives the 1.8 TFSI engine a good torque figure of 165Nm at just 1,000rpm, and this peaks at 250Nm slightly further up in the rev range at 1,500rpm – this figure stretches all the way up to 4,200rpm. Peak horsepower is 160hp from 5,000rpm to 6,200rpm. Compression ratio is lower than the 2.0 TFSI though, at only 9.6:1 compression. The final engine is the new motor that goes into the Audi S3 hot hatch, an updated 2.0 TFSI with a higher power of 265bhp at 6,000rpm and a stronger peak torque of 320Nm constant up to 5,000rpm. To keep up with the stronger boost, the engine features pistons with stronger pins, stronger conrods and a reinforced cylinder block made of a new highly heat-resistant alloy.